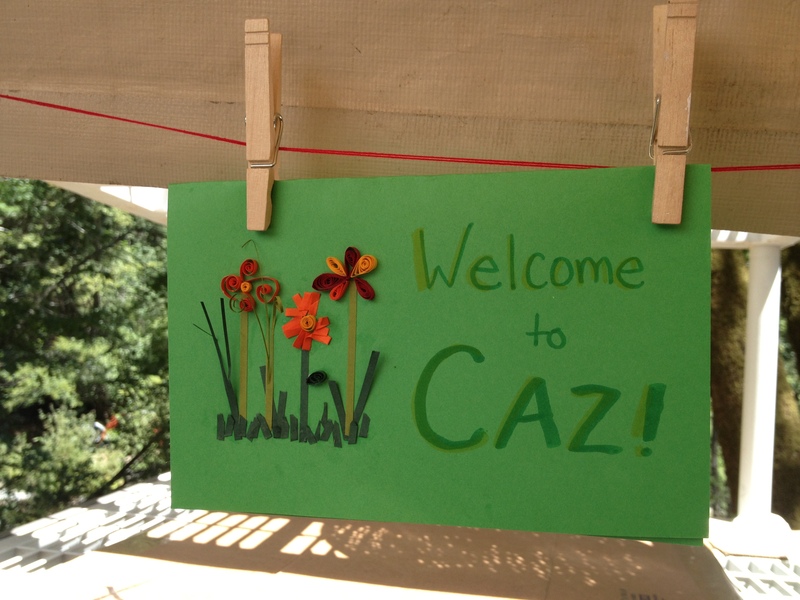 I returned last week from an amazing time at Cazadero Performing Arts Family Camp in Cazadero, CA. It’s a camp full of Berkley music people, but there were also campers from as far as Texas and Japan. I was lucky to get recommended to teach art classes, and had the privilege of creating and naming them myself. It being my first year, I had no idea what to expect! All I knew was that I wanted my classes to be open to just about anyone, so I planned on having people competent in crafting and some who were trying something totally new. Ages were 5-70 (maybe older), so it made for a very high energy, interesting class. There are four class periods, and I taught all four! (I found out that was a bit excessive, so next year I’m going to *take* a class). The first class I want to write about was “Pens and Plants”, which in the literature purported itself to be a mixed media nature class where we’d draw, sculpt, papercraft and felt. This was the largest class, since the description had a little something for everyone. The first day I introduced the class to quilling. Here’s a tip– younger kids are not going to like quilling, as it requires manual dexterity that is simply beyond them, something I’ll remember for next year. Quilling was to be a one-day project, where we would make a simple design we could hang or use as a card. Several people decided that they wanted nothing more than to quill, and spent all 5 days on their projects. It being only a one-day project, my own expertise was not, well, expertise. By the end of the week, these campers had come up with things I’ve never done, or seen, before. Next year– week-long quilling class! For more awesome quilling visuals, check out Lyn Chapman’s quilling board on Pinterest, or pick out something amazing for yourself on Etsy. Teaching was a blast, but I will admit I was a little scared of going hours from home by myself and sleeping in a tent for a week (in a tent, on the ground, 7 days), apart from not knowing what camp was like. I went expecting to do a job, and I came back with a lot of great experience and as a member of the Caz community. I can’t wait for next year! Thanks, Amy! We had an amazing time mask making with you! Once I get time, I’m going to add another post about the masks, along with links to tutorials. Thank you for taking my class. I hope I see you next year!